The conventional treatment of acid reflux today is mostly based on acid suppression; blocking the mechanism that releases acid; or prevention of stomach acid production. Major pharmaceutical companies promote these drugs as miracle cures which more often than not are top money spinners for them. But these drugs do not solve the acid reflux problem. If anything they actually make it worse. The drugs dramatically reduce the amount of hydrochloric acid in the stomach thereby diminishing the ability to digest food properly. This eventually increases the risk for various chronic degenerative diseases. The reduction of the acid also reduces a very important defense mechanism against food-borne infections and increases chances of food poisoning. As more and more people suffer from acid reflux and medications are not very effective, it would be a good idea to take a look at natural treatment for acid reflux. Of the following remedies listed it is highly likely that only some of them will work for any one person. That is because acid reflux is a very complex condition that takes many different forms and has many different causes and a remedy that works wonders for one person may actually exacerbate symptoms in another. Treatment is therefore based on trial and error. 1. Drinking about a gallon of filtered water daily along with high doses of probiotics will help restore normal stomach function for most people. The water will remove toxins, dilute the acid and normalize the pH in the stomach. 2. Garlic has wonderful antibacterial, antifungal, and antiviral properties and optimizes the intestinal flora. It is effective in killing Helicobacter pylori, the only organism, resistant to the hydrochloric acid in the stomach. The garlic must be fresh and must be chewed, crushed or mixed with juice to allow allicin, its active ingredient, to work. 3. Ginger aids in digestion. Fresh ginger can be ground and added to foods or taken as tea or in capsule form. Chewing on a piece of candied ginger after meals is also just as helpful. 4. Digestive enzymes. 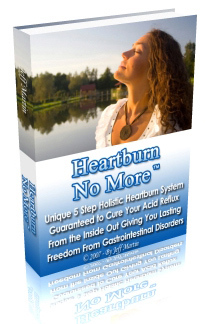 They speed up the digestive process and eliminate heartburn. Papaya enzymes may be taken after meals with a full glass of water. 5. Increasing natural fiber. Bulk foods absorb excess acid and gas and eliminate toxins faster. 6. Green tea helps in digestion and soothes the sensitive tissues of the stomach. 7. Herbs like peppermint, chamomile, licorice root, lavender, orange peel, catnip, and fennel help repair the lining of the digestive tract. Tea made from these herbs is very effective. It should be sipped slowly and should be at moderate temperature, not too hot or cold. 8. Bananas have a natural antacid effect on the body and are very beneficial in relieving heartburn. 9. Clove oil in a glass of water also helps in digestion. Caraway seeds are also believed to be a great natural cure for heartburn. 10. Turmeric stimulates digestion and prevents acid build up. It can be used in cooking or taken as capsules. 11. Probiotics. The use of acidophilus capsules has helped relieve heartburn in some patients. 12. Almonds taken in the morning and/or after meals chewed well are believed to prevent acid reflux. 13. Orange-peel extract for relief from occasional heartburn, acid indigestion, and upset stomach. 14. Apples. Eating apples after meals alleviates acid reflux in some people. Choose organically-grown apples and chew well. 15. Apple cider vinegar. Two to three tablespoons undiluted for acute attack or same amount dissolved in warm water to prevent recurrence. 16. Aloe vera. It is hailed as a miracle remedy by some people. 17. Chewing sugarless gum for 30 minutes after meals stimulates saliva production and aids in digestion as well as helps wash down food from the esophagus into the stomach. One comes across any number of suggestions for natural treatment of acid reflux. Unlike antacids and acid blockers, they do not aim only at relief of symptoms. Most go beyond the physical symptoms and treat the underlying cause that led to this problem in the first place. Above treatment will be more effective if combined with other modalities such as losing weight if overweight, exercise, and stress management, regularizing sleep and diet habits, dietary modifications, etc. This holistic approach will eventually lead to a healthy body.